Woodinville Warehouses hold neat surprises. Facelli Winery was another stop on our September day trip to the Woodinville warehouse district. This was my pick, and I chose them because they specialize in the harder to find Italian varietals. I’m intrigued by wines that you don’t see often, and Facelli has a Barbera and a Lemberger. They said a Dolcetto is in the works. Facelli is family owned and operated, and the family is serving in the tasting room. They make many different varietals, and are really friendly. You can see the pride that they have in their wines. I picked up several, because they have some truly unique wines. Anton Ville is a small winery with only five wines. Their white, called Harmony, is a Viognier and Riesling blend, which is light and fruity summer white. At $15, it is also very affordable. They do a great job with their reds as well. They offer a Merlot, a Cab. Sauvignon, a Cab. Franc, and a Merlot based blend. The wines are much more refined than I would expect from a startup winery. The reds have been aged for a long time, with the 2005 vintage currently selling. I’ll be looking forward to seeing what else they put out. Guardian Cellars was certainly the standout for the day. The vibe in their tasting room is young and hip, and they have their walls covered in concert posters from bands that Jon likes. They have good music playing, and they make you feel welcome. They offer a Sauvignon Blanc, called Angel, and a Cabernet Sauvignon. They also offer several blends, with Cabernet Sauvignon, Merlot and Cab Franc. One word about their wines: Excellent! Strong, oakey, Cabernets are not my style, but Guardian Cellars wines are so balanced that they appeal to a variety of palates. We are lucky enough that our local wine store carries Guardian Cellars wines, and we have purchased several. We will certainly visit again. 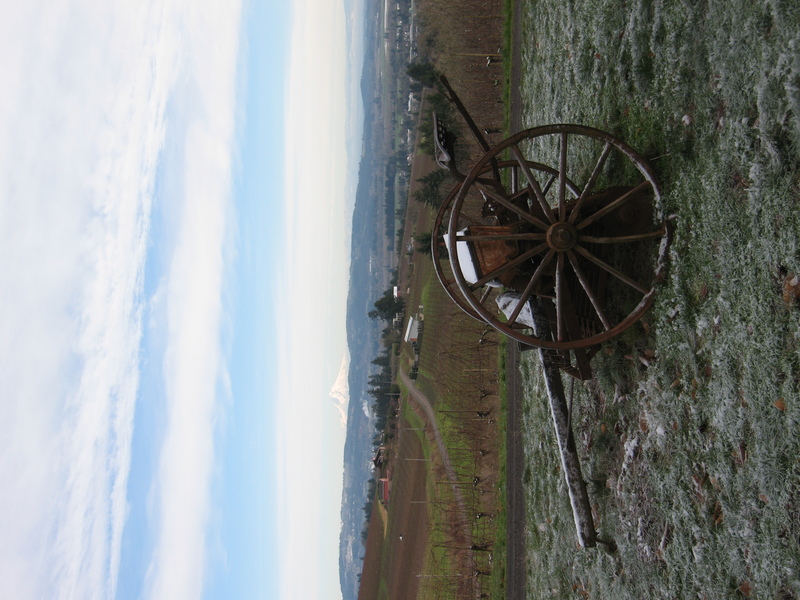 On New Year’s weekend, Jon and I were heading down to Portland to visit family, so we took a day to ourselves and headed over to one of our favorite wine regions… the Willamette Valley. We have vowed to go to at least one winery on each visit that we haven’t been to before. It was New Year’s Eve, which I thought would be very busy, but surprisingly, there weren’t many people out and about. Our first stop was to Torii Mor winery. Jon has had their flagship Pinot Noir, the one you can get at the grocery store, but I have never tried their wines. We sampled their Cote D’Mor Viognier, the Reserve Pinot Gris, the 2008 Willamette Valley Pinot Noir, the 2008 Deux Verres Pinot Noir and we finished off with their 2006 Syrah Port wine. I enjoyed their Viognier, but found the Pinot Gris to be not fruity or crisp enough for my taste. Jon and I both thought the Willamette Valley Pinot was a light and easy everyday drinking wine, but it lacked much pizazz. The Deux Verres Pinot Noir was very nice, as it has a more robust flavor. The Port wine was excellent, with a strong flavor that would be great poured over cheesecake or ice cream. The server was friendly and talkative, and the atmosphere was nice. We were alone the whole time we were there, so having a personable server really made a difference. After leaving Torii Mor, we decided to turn right and go up the hill instead of heading back down to Highway 99. We passed a couple of wineries that looked interesting, but were closed for the New Year’s holiday, so those will be ones we want to visit in the future. We stopped next at Maresh Red Barn Winery, which for us was a complete unknown. They have been in business since 1970, but apparently just sell from the winery. They are located in a 100 year old barn, which had antique glass windows and an amazing view. This would be a great place to visit in the summer too. Here we had five wines, a Pinot Gris, a Chardonnay, and three Pinot Noirs. The Pinot Gris was the standout here. It has clean and crisp, with green apple flavors. The Chardonnay was very good too, but unlike a traditional Chardonnay – this one was completely unoaked. Their three Pinot Noirs were light and fruity and were all very soft. I would have preferred a bit more from the Pinot. We purchased the Pinot Gris, and after leaving, I think we should have purchased two. 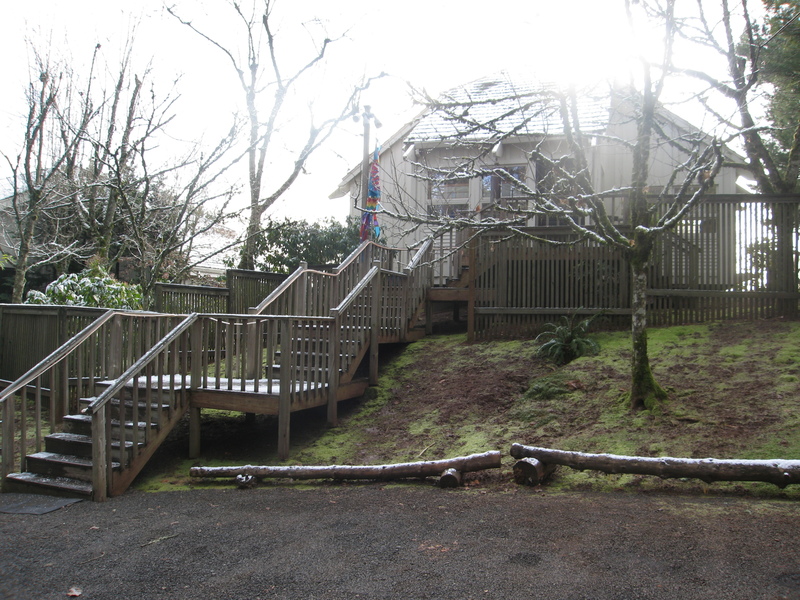 Next up we headed to Sokol Blosser, which we have been thinking about visiting for a while. The atmosphere here is more contemporary, with a a younger vibe. They have a huge floor to ceiling window in the tasting room that looks out on Mount Hood, which was clearly visible on the day of our visit. The view was spectacular. Our servers were both young and hip, but knew about their wines. Sokol Blosser is a certified organic winery and practices sustainable farming techniques. We tried their Pinot Gris, which was very well done. It was another crisp, clean fruity Pinot Gris, that will be perfect when the temperatures warm back up. We sampled three vintages of their Dundee Hills Pinot Noir, which is a blend of all their blocks of Pinot Noir grapes. We started with the 2008, and finished with the 2006. It was interesting to see how the 3 vintages were so different, with the ’08 being a great balanced Pinot, the ’07 being very soft and light, and the ’06 being a robust strong Pinot. Jon and I both liked the 2008 best. Jon really liked their 2007 Goosepen Pinot Noir, which is a single vineyard wine, but I thought it wasn’t different enough from the ’07 Dundee Hills to justify the difference in price. We finished our tasting with the White Riesling Dessert Wine, which was a lovely sweet dessert wine. 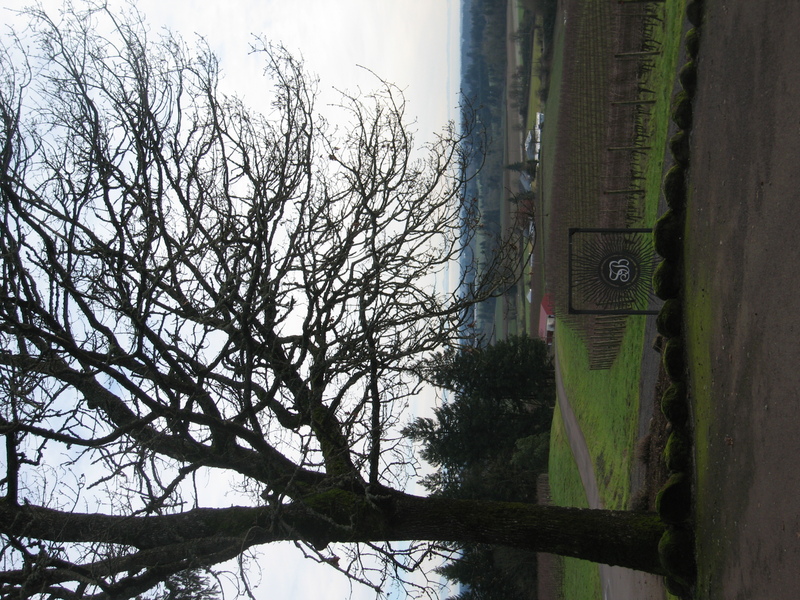 Sokol Blosser was our untried winery star for the day – we both really enjoyed all of their wines. We ended our day at Chehalem, one of our old standbys, which is always excellent. We tried their Pinot Blanc, which was very good. There aren’t many Pinot Blanc varietal wines out there, so I’m always looking for good ones. Jon and I also both love their Cerise, which is a wine that is Gamay Noir blended with Pinot Noir. Gamay Noir is a grape similar to Pinot Noir, but it has a strong delicious cherry taste. Chehalem always does a great job with their Pinots and this year’s are no different. Everything they have is delicious – you can’t go wrong whatever you buy. It was certainly another day well-spent in the valley. Can’t wait to be back again. I don’t have my camera cord here, so I’ll post pictures soon.